The devil is in the details and, when anything expands, the details include equipment. That’s an ongoing issue around here. A few years back we started Sinful Sundays and hoped for ten planes to attend. Last year, every Sinful Sunday attracted around 100 planes. The experience has been the same with the fly-in. With each stage of growth, people, planes, or activities, a new piece of equipment follows. This past season was no different. With the continual growth and strong attendace numbers for Sinful Sundays and the fly-in established, this year a few things needed to be addressed. One of these included a need for more business space. Lacking was room for selling snacks, food, and even drive-in tickets for the fly-in. To solve this problem, we felt a solution that would also add to the ambiance of the events was necessary. 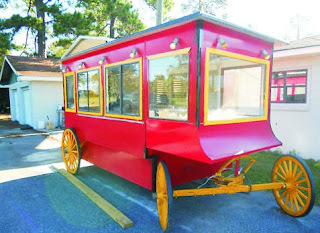 That’s how we ended up with a circus wagon; in its past life a popcorn wagon. And, as with most things, it needs a little work to make it perfect. But, we think you’ll agree it fits right in with the grand scheme of things. Another issue that has grown from the success of these events is the ability to move people around the airport. Through the years, pilots have always tried to cross the runway while aircraft were operating from it and we just had to find a good solution to this problem. In the past, local farmers used vintage tractors to pull trams around the airport. But then this past year revealed a weakness with this plan when a late harvest left us with no farmers or vintage tractors to pull our trams. In the future, we will be searching out donations of small vintage tractors so we don’t have to rely on others to pull our trams but for now we have come up with a great solution. Actually, Ginger did. 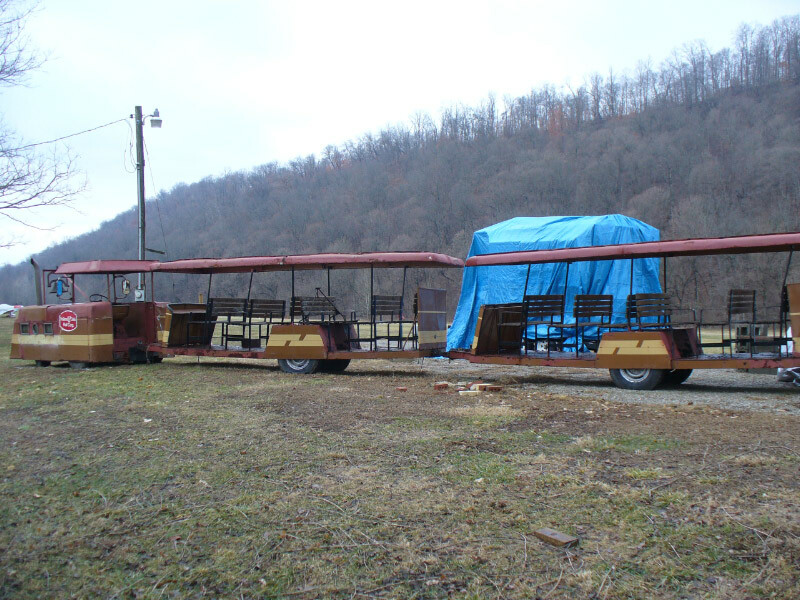 I was away on a trip when she told me, “I just bought us a tram.” My head immediately began to spin and continued to do so until I saw it. 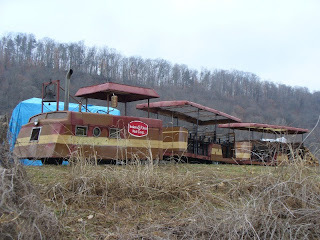 This thing was once the Cincinnati Zoo tram and we managed to get it really cheap. The photo here does not show the third people mover that goes with it but I think this will give you a feel for what it is. 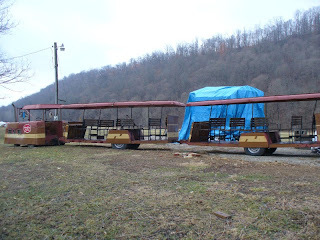 When all three wagons are hooked up, the “train” can move almost 60 people. This spring, we’ll be working on both of these items and looking for folks who might want to volunteer to help “rebuild” them. They both work ok right now but need some work to be perfect. Thanks to everyone who contributed to the airport fund last year. Some of the funds went toward these pieces of equipment that will specifically support the growth of airport events. What a cool vehicle - way to go Ginger!!! For a minute there I thought you were starting a government operation, with a circus wagon!